Black Bean sauce can be a wonderful rich fullness to an Asian meal, or bring with it an overbearing saltiness which destroys it. Why not take all of the guesswork out and make your own? It’s really not that hard, and you know exactly what’s in it. All you need is a source of tinned fermented/salted Black Beans (no pun intended) – try the ‘specialist’ section in the supermarket, or your local Asian store. The sauce keeps well in the fridge for a few weeks and can be frozen in portions for use as required. Recommendation – Stir it into Chicken Chow Mein for the most amazing dish! Love this sauce! Do you have a recipe for satay sauce too! Hi Maggie, so pleased you like it! I’m still on the lookout though – if I come across something good, I’ll let you know! 🙂 Anything homemade is better than premade (store bought). Less sodium for 1 … and you know exactly what has gone in it for 2! 180g of black beans is nowhere near 4 tablespoons — which do you mean? 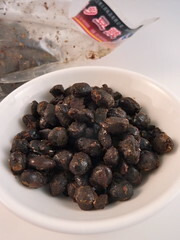 A tablespoon is 15ml, and black beans are probably rather less dense than water, so 4 tablespoons would be less than 60g. Or alternatively, 180g would be something like 15 tablespoons. Hi Mike, I used a 180g tin, drained & rinsed. The tablespoon measure would have been heaped and a crude indication but I accept that would still seem a little light.